In a simple shade and shadows rendering environment like that of the DesignWorkshop® modeling window, the visual properties of an object consist merely of the color value used for shading and shadow casting. In the more complete rendering environment of the DesignWorkshop Lights and Textures window, the visual properties of an object also start with color, but go on to include an expanded set of optical characteristics, based on a material type and an optional texture map. This provides for renderings which can be created very quickly and easily, and which can be very realistic looking, although they are generally not entirely accurate in the finer details of lighting effects. In a full lighting simulation such as provided by Radiance, the optical properties are taken fully into account for both direct and diffusely reflected light, providing for the ultimate in realism and accuracy of even subtle and complex lighting conditions. The challenge to using this ultimate technology is working with a more complex project definition, including complex material types, and understanding the real physical properties of materials that underlay each material type. # red, green, and blue are in physical units of radiance, watts/steradian/square meter. # angle is full cone angle of spotlight. Direction is output direction, in three components. # red, green, blue are reflectance - values greater than 0.9 are not usually realistic. # Specularity greater than 0.1 is usually not realistic. 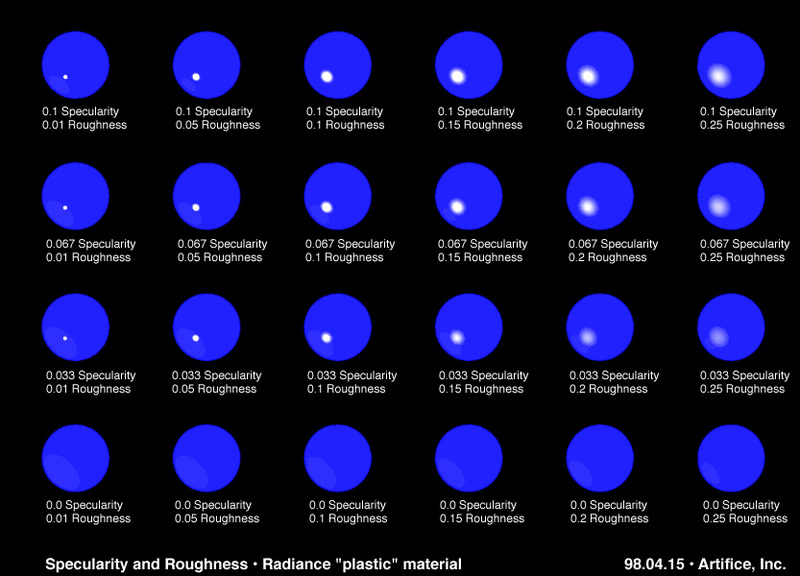 # Roughness varies from 0=perfectly smooth, to 0.5=perfectly rough. # Roughness greater than 0.4 (?) is usually not realistic. # Specularity greater than 0.9 is typical. # Roughness greater than 0.2 is usually not realistic. # A transmission value of 0.96 is typical, for standard 88% transmissivity glass. # Used for translucent materials. Transmissivity is the fraction of light that gets through the material. transmittedSpecular is is what gets through without being diffusely scattered. # Other options are available in the mirror material for advanced use. Other material types, used more rarely, include illum, dielectric, interface, and antimatter. See the main Radiance site materials overview for details. Patterns and texture come in some pre-defined types, just like the materials they modify. These types are listed below. Patterns and textures are modifiers for the basic Radiance materials. By listing a modifier Radiance patterns vary "2D" optical characteristics of an object material across the object surface. Textures vary the apparent local shape of a surface by pertur bing the surface normal across the object surface, which causes shading variations perceived as bumps, waves, etc. Both patterns and textures can be either based on bitmap image data, or on mathematical procedures. Procedure files for both patterns and t extures are indentified by the extension ".cal", and the bitmaps for image-based patterns are indentified by the extension ".pic". (No bitmap data files for texture definition are actually supplied with Radiance.) The bitmaps and math functions live outside your Radiance scene description file in auxilary files. You make reference to these external auxilary files in the scene description to establish complex material definitions. In fact, we will mostly use the set of auxilary files that come with Radia nce, which can be found on Darkwing at /usr/local/lib/ray. Use that full path name when referencing the auxilary files so they don't have to be copied over and over again. Patterns and texture come in some pre-defined types, just like the materials they modify. They are listed below. To apply a pattern to an object, the pattern is defined, and then used as a modifier to the material definition for the object. Procedural patterns which vary material color have the type "colorfunc", while procedural patterns which vary reflectance have the type "brightfunc". The number and purpose of parameters varies among procedural patterns and textures (hence the notation "4+" and "nÉAn"). Then, you can apply the wood_floor material to an object by making wood_floor the modifier (first field) of the object. By substituting a different ".pic" file from /usr/local/lib/ray and by adjusting the scale carefully, this setup can be used to apply a wide variety of patterns. To apply a pattern to an object, the pattern is defined, and then used as a modifier to the material definition for the object. Procedural patterns which vary material color have the type "colorfunc", while procedural patterns which vary reflectance have the type "brightfunc". # [A1 controls size, yes, but apparently not cycles/unit] Here the size = 0.5. # to the top and south faces, but not to the west face of a block. To go there while logged in with Telnet, use the "cd" command"
© 1995-97 Kevin Matthews, All Rights Reserved. This document is provided for on-line viewing only.